Idaho was first popularized in basketball way back in the day. When looking for why the University of Idaho goes by the name of Vandals, you need to look no further than 1917. Student newsie Harry Lloyd “Jazz” McCarty slapped the “Vandals” name tag on the basketball team because the had some stingy defense. The name stuck and in 1921 it became the official school name. We’re not sure where the mascot version of the team name showed up, but we’re certain it had to be somewhere around the 1970s. Why the 70s reach on Joe Vandal? First let’s go over the stats. 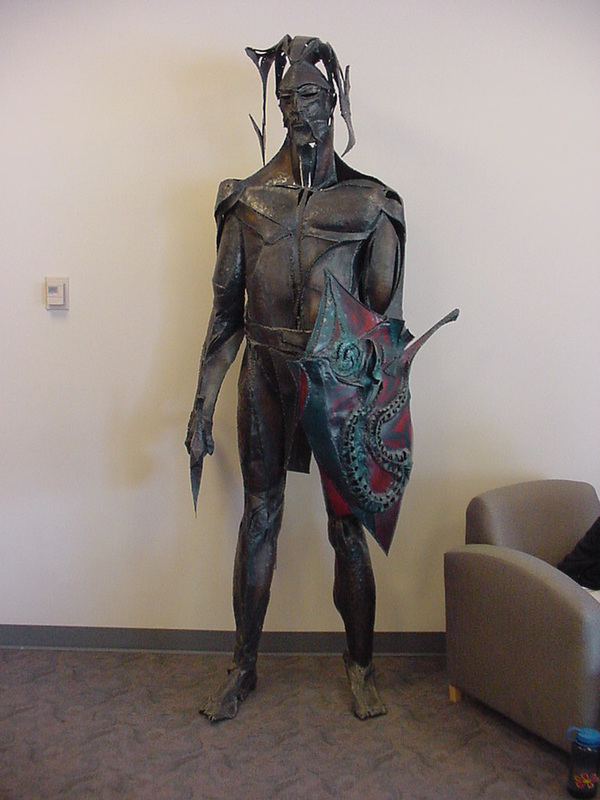 Joe Vandal has the typical football uniform and pads for the body. He’s got big padded arms and sometimes wears gloves instead of padded hands. 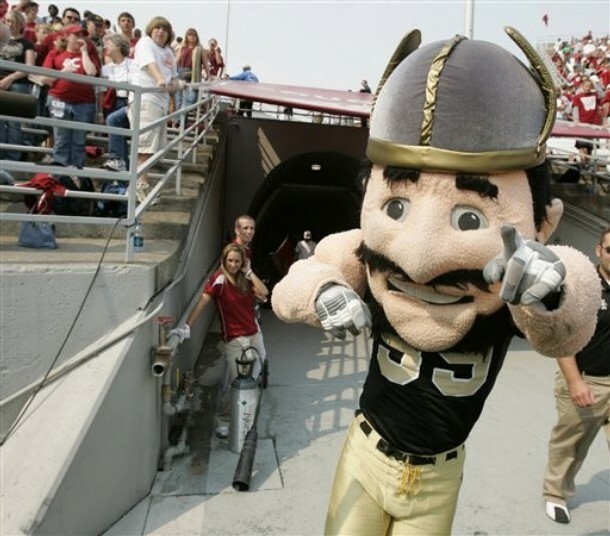 The mascot head is the huge variety, with a spiked helmet and an awkwardly pleasant smile. The stache rolls from the schnoz on Joe and turns into a full out Bluto bears once its done. This reminds us of some California desert hippie strung out on the 60s and waking up to the 70s. Right in the middle of bat country. But this isn’t California, it’s Idaho. And for some reason there seems to be a hoard of Vandals there. Vandals were once known as a vicious Germanic group that steamrolled Gaul, Spain, and North Africa around the fourth and fifth centures right before Rome knocked them out for the count. It’s a pretty good choice for a mascot and judging from the pic above, we are almost certain to have an upset Thickburger-laden belly later on tonight. Which is why we are a little concerned with Joe Vandal. Joe Vandal is a much more likable version of the fierce Vandal. What really throws us off is the stache, but the somewhat goofy half-giggle grin doesn’t help his case. In this case, we would rather see the super angry looking mascot the friend of children mascot. A nice extra touch would be some sort of blunt instrument that Joe could yield during games. Maybe make it lob t-shirts at the crowd. Anything to give this guy some rusty edge. 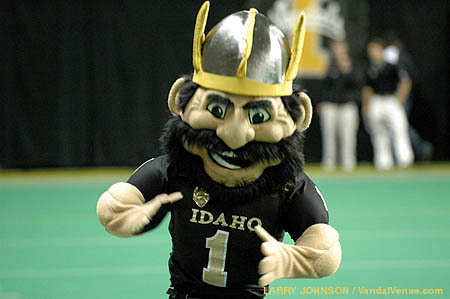 Joe Vandal is not the worst mascot. He could use some extra seasoning from his University of Idaho spuds to rough up his edges. From California to Idaho, we will never see a Vandal. But we could hope for a dirt bike race. In the mean time, if you see Joe Vandal cheering on the sideline, give him a “Hell Yeah” because chances are that Rome is burning on the football field again.